You are here: Home / Where Should I Buy Beads? Where Should I Buy Beads? If you can’t find the beads you need for your jewelry-making projects from us, here is a list of our favorite places to buy beads. Each site has their own specialty, so take a look and see which is your favorite. As we find more sources we will add them to this page. Keep checking back for updates. Etsy is the best place to go for unique, handmade beads. 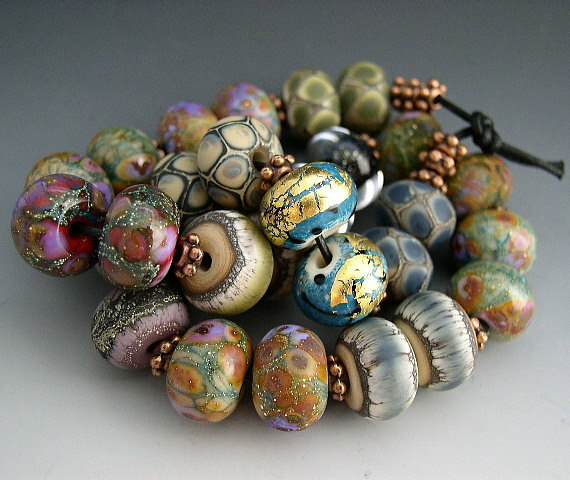 Artists sell their own handmade beads for a lower price than you can get them from any store. You can find small batches of beads that would never be available in bead stores. You can also order custom-made beads directly from the artist. Additionally, you can find vintage beads that are hard to find. Etsy has an excellent search mechanism for finding what you want. Craftsy is known for its tutorials and classes, but you can also find supplies and digital tutorials that you can download to make your own projects. When you search for beads, you can go through the results to find any supplies or digital tutorials or you can select a class to inspire you to try new techniques. This site specializes in glass beads, with an emphasis on Czech glass, pressed glass, vintage glass and Japanese seed beads. Really beautiful beads. Pictured to the right are some examples. If you can’t find the bead you like for your European bead bracelet from Ohm Beads, the next place to look is on the Chamilia website. They have a particularly beautiful set of alphabet beads for the large-hole bracelet, silver, gold, and lovely dangling charms. You can also buy earrings to match the beads. This is a fun site to browse. If you are looking for pearls, Swarovski crystals or Hill Tribe silver elements, this is a good place to look. Hill Tribe silver is very unique and has a vintage patina style. Definitely worth checking. One of the oldest jewelry-making supply companies, Fire Mountain Gems specializes in a wide range of beads as well as beading supplies and packaging. You can find pretty much everything here at good prices. Designed to be a wholesale supplier for serious artists, Fire Mountain Gems offers seed beeds, glass and crystal, pearls, metal beads and a multitude of stringing options, findings and more. Joann’s is not just a fabric store anymore, they have lots of crafting supplies. Their bead selection is limited, but they do have a lot of nice bead boxes, carriers and findings. Most of the beads they carry are lower end.